The great white hunter, MDR, became the hunted today, set upon by two tiger sharks whilst spearfishing near Arlington Reef off Cairns. 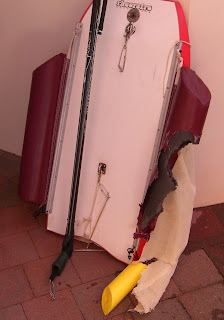 More precisely his Fishski was set upon, the Fishski is MDR's floating catch receptacle which must be quite irresistible to the sharks, a mesh bag hanging off a float with gore from dead fish oozing out into the water, just like burley really. Fortunately the sharks didn't actually attack MDR and he was able to escape unscathed, albeit with a smaller catch and a lower ranking in the spearfishing competition. MB declared that MDR is grounded from now on, of course MDR is studiously ignoring this plea from his beloved. what a day, dont worry marc I don't listen to Hana either. but cant live without them. He never told me about that!!! Glad that MDR is OK, although in photo he looks a bit shaking,and who wouldn't when you look at the damage that was done. What an experiences. And he is one that got away!! from two man eaters, Well mark it was not a good day to die! !